Hey there, friends! 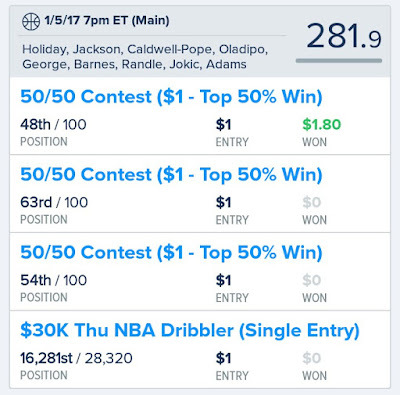 Who's ready for another Fanduel NBA Lineup?! I ended up 1 out of 4 last night. 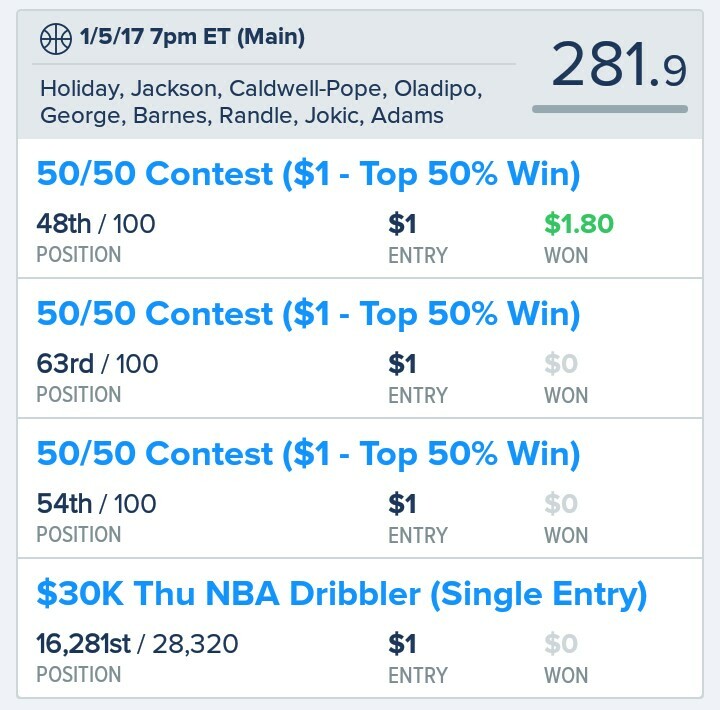 A few of the last minute changes really screwed with my lineu (SHOULD HAVE LEFT McCOLLUM IN!!!) but that's just the way the ball bounces sometimes. Let's jump right in! Isaiah Thomas: Man, this guys is on fire! 50+ fantasy points in his last two games and 49 fantasy points on the third. His hand is hot and you'll want him on your team while the price is still affordable. Malcolm Brogdon: As of right now, he's in the lineup. It all depends on whether or not he continues to start. Brogdon has been a pleasant surprise in his starting role and has managed to hit at least 20 fantasy points in that role. He's occasionally topped the 30 fantasy point mark so he has the potential to exceed 5X his value in return. Josh Richardson: The Heat are hurting right now and any able bodies are going to get the minutes. Especially more so now that Winslow is out for the season. Richardson should continue to get the minutes and the opportunities to shine. Klay Thomspson: Thompson averages about 35 minutes a night, which means that he'll probably still see action when the Warriors are well ahead of their opposition. Also, he has the potential to go off at any time sky rocketing through that 30 fantasy point average that he has this year. Kevin Durant: Durant is simply thriving with the Warriors. I'm surprised his price isn't in the 5 figures yet. Though the Warriors have plenty of weapons, their fast pace offense gives plenty of opportunities for their stars to get their share of fantasy points. Durant has only scored under 30 fantasy points twice during his last 20 games and has eclipsed the 60 and 50 point mark on more than a few occasions. Andrew Wiggins: I'm looking for Wiggins to bounce back tonight. Prior to last night's game, Wiggins scored over 20 points in his last 5 games. I'm hoping that last night was simply a bad night for him (only 16.5 fantasy points) and a favored match up against Wizards is what he needs to get back on track. Serge Ibaka: He has a good match up against the Rockets, especially since this is the second game of a back to back for the Rockets. Ibaka has been held to under 30 fantasy points these last 2 games but he should be able to take advantage and punch through that tonight. Ersan Ilyasova: I'm loving Ilyasova if Embiid and Covington are limited in tonight's game. Though Ilyasova has held his own with with Embiid and Covington on the floor, his fantasy value shoots up when he gets the minutes. Greg Monroe: Henson and Monroe have been splitting the Center minutes, but it seems that Monroe will be taking over that spot sooner rather than later. During his last 2 games, Monroe averaged closed to 30 minutes per game and close to 35 fantasy points. He's fast becoming an inside force for the Bucks and you should snag him on your team while the price is still low.